It’s just a matter of weeks before college football sweeps the nation once again. Most of us will be catching the must-see matchups from the comfort of our living rooms, but if you’re one of the lucky few to go see a game in person, you’ll get to enjoy all the pomp and circumstance that comes with game day in a college town. 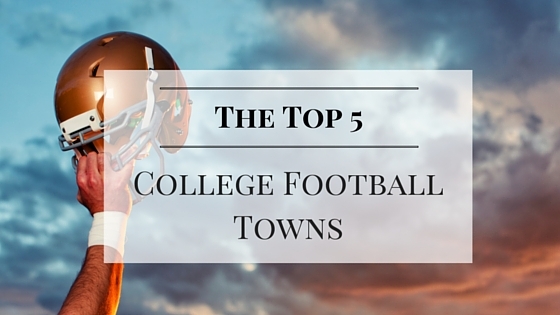 Here are a few of the top college football cities to visit for the best game day experience. 1. Ann Arbor, MI – The city the Wolverines call home has long been a mecca of college football. Not only is the stadium gigantic and always garners a raucous, passionate crowd, but the city has a great selection of local eateries and breweries that can accommodate crowds after a big win. The landscape is also ridiculously picturesque in autumn which has given Ann Arbor its “Tree Town” nickname. 2. Baton Rouge, LA – LSU owns the night on home games. With a nearly unblemished record playing in front of their home crowd under the lights, the Tigers and their eardrum-ringing crowd are a force to be reckoned with. Soak up those early beers with the inevitable spread of Cajun food you’re going to find in a sea of tailgates, many of which have been there for years and have their own specialized tailgating gear, group name and history. 3. Austin, TX – Home of the Longhorns, Texas’ capital is a must-see spot for college football. While the on-field product has experienced some growing pains over the past few years, the stadium atmosphere is always top notch and the surrounding area is as well. Great barbeque within walking distance, a huge selection of bars, relaxing down near Town Lake and catching some live music are just a few of the things you can do before and after the big game. 4. Eugene, OR – Since the Ducks became a mainstay in the college football elite, their hometown has football fans flocking. A pristine, state-of-the-art stadium draws huge sellout crowds for every game, the city is nestled in a valley of over 40 breweries and great outdoor activities are just a short drive away in any direction. 5. Blacksburg, VA – Much like Longhorn fans, those who support the maroon-and-orange-clad Hokies have had a rough go of it for the last few years when it comes to wins and losses. None of that takes away from the beautiful scenery on the Virginia Tech campus and the great football traditions. Wander through the beautiful fall colors on your way to a tailgate loaded down with hearty football grub, watch the team and cheerleaders parade into the stadium, jump up and down with 60,000+ fans to “Enter Sandman” when the Hokies enter the field and grab yourself a skull-sized turkey leg to munch on during the game. There’s nothing quite like a football game in Blacksburg on a cool, crisp night. Whether it’s the tailgating, the stadium atmosphere or the city getting involved, these spots have proven to be some of the best college football towns in America. Got one you think should be on this list? Let us know in the comments below! An injury to an athlete can be as minor as a cut on the arm and as serious as reconstructive surgery. For people who devote their entire lives and livelihood to staying healthy and fit, the threat of injury is always a concern. We’ve all heard about the unfortunate career-ending injuries past and present, but we’re probably even more familiar with the athletes who came back from seemingly rock bottom to produce stellar performances. You may know of one that hits closer to home, but here are some of what we thought are the biggest injury comebacks in sports. Kerri Strug vaulted the U.S. Women’s Olympic gymnastics team to new heights when she landed probably the gutsiest vault anyone has seen in Olympic history. Strug badly injured her ankle on her first vault, leaving many to believe there was no way she could land a perfect second vault to give the Americans the gold medal. Despite excruciating pain, Strug ran down the mat, executed a perfect vault and landed on one foot to seal the deal for the American team and cement her place in sports history. Bethany Hamilton loved surfing from the moment she could stand up on a board. A shark attack when she was just 13 years old left her without her left arm. In a show of courage and confidence, Hamilton was back on her board and competing just three weeks later. She’s gone on to carve herself a very successful career in professional surfing. Drew Brees tore his labrum and partially tore his rotator cuff in his throwing arm while playing for the San Diego Chargers in 2005. After intense rehabilitation and a lot of hard work, Brees found his way to New Orleans and led the Saints to their first ever championship. He’s gone on to become one of the most successful quarterbacks in NFL history across the statistical board. 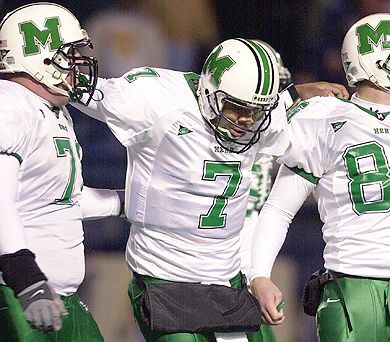 Byron Leftwich broke his left tibia during a game against Akron University. After receiving an X-ray, Leftwich came back into the game and tried to spark a rally for the trailing Marshall Thundering Herd. While they ended up losing the game, his guts became a thing of sports lore. Many spectators remember him hobbling on one leg to make amazing throws and his lineman carrying him down the field between plays to reach the line of scrimmage. Niki Lauda is a household name in Formula One racing, and he regularly spoke out for driver safety during his time in the sport. In 1976, the German Grand Prix was scheduled to be raced, and Lauda tried to garner support for boycotting the race due to poor safety standards on the track. Without the support, Lauda decided to drive and was involved in an accident that caused his car to burst into flames. Badly burned and having fallen into a coma, Lauda miraculously raced just six weeks later and finished fourth in the Italian Grand Prix.